I recently wrote a review of BeadTool 4 that you can find here on the BellaOnline beadwork site. I'm really impressed with it. In the article I used some pictures I took of mushrooms to show how nicely the photo conversion works. 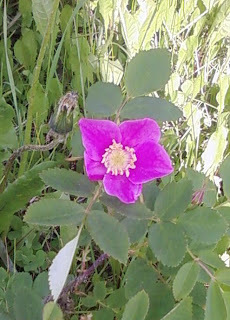 I just used one of those wild rose pictures I took this summer and converted it to a 50x50 peyote stitched pattern. The realistic bead image, set at size 12 for export. Indexed, unshaded beads, same pattern. It also generated a color list. As usual, click on the images for the full sized view. I really really like this program. It won't replace the way I usually graph, but for photo conversion it's really wonderful.